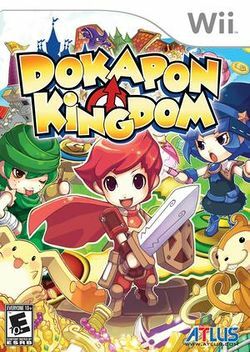 Dokapon Kingdom is a video game for the PlayStation 2 and Wii, developed by Sting Entertainment and published by Atlus. It is a console role-playing game in which four players are assigned a mission. The game was released in North America on October 14, 2008. The game is a hybrid board game and RPG with modes varying from story mode to battle royale. Players can use any of the three main controllers that work on the Wii: a Wii Remote, Classic Controller, or a GameCube controller. Dokapon Kingdom focuses on player vs. player efforts to save the kingdom. Due to the tension these events are likely to cause, Atlus has dubbed the game "friendship destroying" in their marketing materials. This page was last edited on 25 August 2009, at 19:37.